It's Taste&Create time again! This month my allocated partner was Katie, from One Little Corner of the World. Katie is a teacher by day, blogger by night and in her own words feels that cooking is in her blood. Hey, I can relate to that! Pastas seems to be Katie's big speciality, but with the current three month long heatwave we're experiencing (otherwise known as summer), I decided to skip past the pastas and turn my attention to something a little bit more weather appropriate. And how glad am I that I did! The spice mixture elevated these beef skewers from simple to sublime. TheHusband even commented that the flavour reminds him of biltong. ** Now if that isn't high praise, then I don't know what is! Thanks Katie - we will be making this rub again. 1. In a spice grinder or mortar and pestle, grind all the ingredients for the rub together until finely ground. 2. Apply spice mixture to the beef and, using your hands, coat evenly. 3. 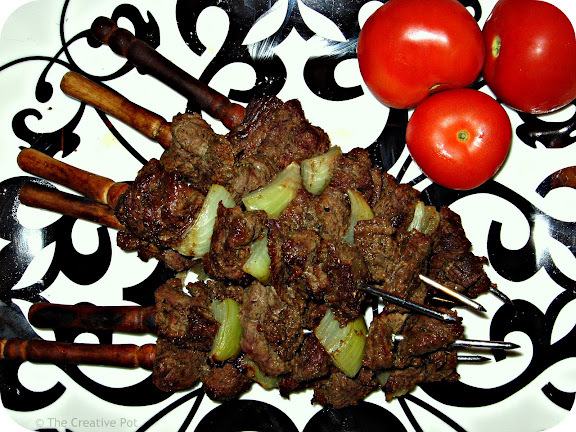 Thread beef cubes onto skewers, alternating with onion. 4. Grill in the oven (or on the bbq) for 10 - 15 minutes or until done to your liking. Serve with a big salad on the side. ** For non-South Africans, biltong is our national obsession. It's an absolute must to snack on while watching rugby (our other national obsession). Some people claim that it's similar to beef jerky, while others scoff at the mere idea that anything could come close to it's unique taste. I'm never quite sure how to season or flavor beef skewers with anything other than teriyaki sauce, which gets old really quickly. Thanks for sharing this! And I've never tried teriyaki on beef skewers, would you believe? :-) Thanks for the idea! I am glad you like them! That is one of my favorite spice blends - We love to grill, unfortunately we are in our three month cold spell, otherwise known as winter :-(. Thanks for being my partner! Oooh, another spice rub for me to try! Have been looking for a nice Mexican spice rub since Woolies inconveniently stopped making their divine lime, coriander and jalapeno rub :( These skeweres look fab - roll on braai weather here in the UK! Re. the biltong connection - I'm guessing it's the coriander seed that makes your husband think of biltong. And re. biltong v jerky - I've had both and they are fundamentally different. Jerky is cut into thin slices (like sliced biltong size) BEFORE it is dried & smoked, so it can never have that moist interior that a full strip of good biltong has when you cut into it. Also, because jerky has more surface area for the seasonings to penetrate, you taste more smoke seasoning and salt with jerkey, whereas with biltong, you actually taste the meat. Very interesting comparison for biltong vs jerky - thanks Jeanne!